Making a baby quilt with some applique on it, it’s always a cute and easy project to work on. It’s always nice to get the news of a new baby arrival to any family and it’s a great motivation to work on a new few projects to make for him or here. It doesn’t matter if it’s knitting, crocheting, sewing, but making a baby quilt I can say it might have a special meaning. A baby quilt will last forever, and it doesn’t matter if the baby is a new born, 3, 6 , 9 months or even older; a baby quilt will be handy anytime. To place the baby on it while he or she plays on the floor. As the baby grow up it can be used as room decoration on a wall. When the baby gets older it can be used as a nap quilt. If you’re the monther to be and you like to sew, a baby quilt is always a nice project to work on, not big and easy to finish in a day or two. If you’re the grand mother (like me, this time) it’s always nice to work on a baby quilt thinking on the new baby child. If you have a friend who is expecting a new baby, there’s no better reason to get a few fabrics and make a cute baby quilt to give it to welcome the new baby. This time I’m happy to share you how I did some applique of a few little birds with applique, as I did it, it helps this baby quilt to be two sides, as the front and the back are good to be used anytime the new mom want to. I made a video (in Spanish) but I think it will help you to see how I work on each step for the applique. You can follow me on Pinterest, Facebook, Instagram or YouTube and be the first one to get the updates of my work. 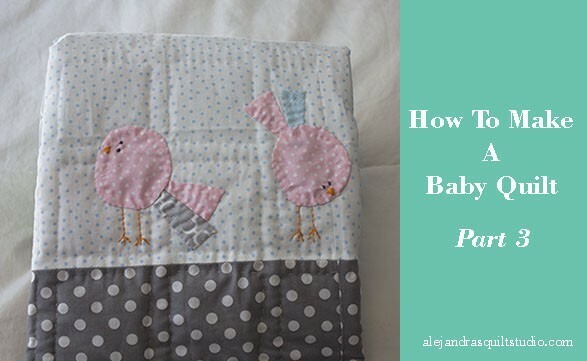 If you’re going to make this baby quilt, you can Pin it so you can find it later. I really enjoyed your website and the lovely photos of the quilts you make. Very artistic and so full of colors a joy for the eyes. What a great idea to make this cute Baby quilt pretty on both sides. I am sure when you presented your gift the mother must have been very pleased with such a beautiful present. I have a very dear friend in Germany who also makes quilts. The first one she made was for her mother, the second one for her daughter and I was honored to get number 3. This is a quilt full of cats, we both are cat fans you know. This lovely quilt is lying on my bed since I got it years ago.